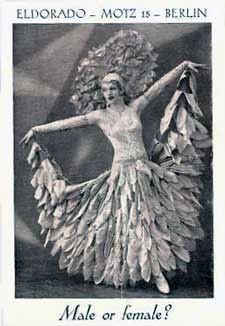 The image is a postcard size advertisement for Eldorado, which was a Berlin nightclub well-known for its diverse clientele during the Weimar era. The ad was up for auction on eBay and I lost out. My high bid was about one-third of the winning bid. I wish I could have added this card to my female impersonator ephemera collection, but I was loathe to bid higher because of the card's condition; the card had damage from being folded twice. (I cleaned up the image you see using Photoshop). "Located at the corner of Motzstraße and Kalckreuthstraße in Berlin's Schöneberg district, the Eldorado was a popular destination during the 1920s and early 1930s for lesbians, homosexual men, transvestites of both sexes and slumming tourists. The nightclub featured cabaret shows, dancing and drinking in a stylish atmosphere." You can read more about it here. The card would have been a nice addition to my collection, but it was too pricey and too damaged for my purse. I love these ephemera cards of female impersonators. I would love to look some some of them... like that short, black-haired femme in a white gown. My...! Yes, some female impersonators are gorgeous!